청소년은 무료입장인, 술없이도 재미난, 자선 드랙쇼! 연인원 1,000명이 참여해주신 제 1회 서울드랙퍼레이드를 성공적으로 마친 후, 애프터파티에 참여가 불가능하여 아쉽다고 연락을 주셨던 많은 청소년분들을 위해 모두가 즐길 수 있는 드랙쇼를 기획했습니다. 주민등록상 미성년자분들은 무료 입장이 가능하며, 주류 판매는 행사가 모두 끝난 후에 시작됩니다. 성인분들은 10,000원이나 그 이상을 후원해주시면 입장이 가능합니다. 후원금의 일부는 행사 진행비로 사용되며, 그 외의 금액은 모두 청소년 성소수자 위기지원 센터 "띵동"에 기부가 됩니다. *본 행사는 기본적으로 한국어로 진행되며 약간의 영어 번역이 제공 될 예정입니다. We have successfully hosted our very first Seoul Drag Parade with a total of 1,000 attendees, thanks to your support and participation. 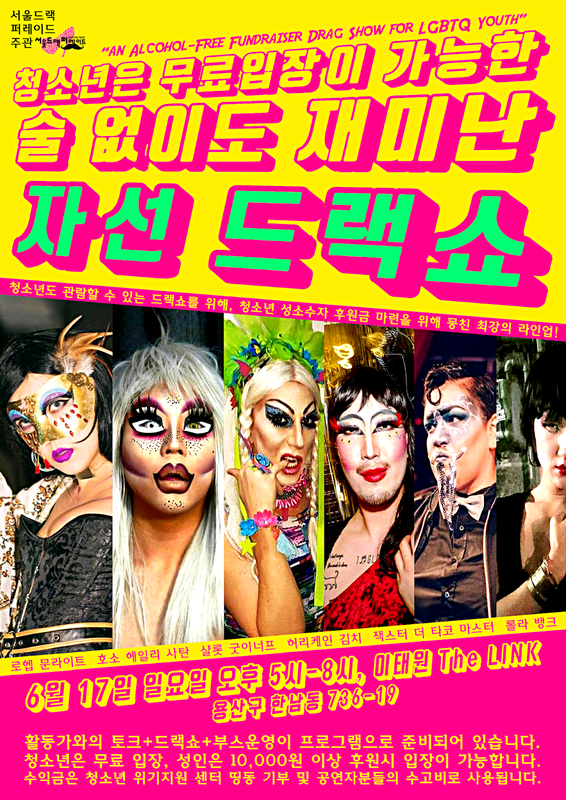 Now we would like to have host a show where everybody (including minors who couldn't come to the after-parties of Seoul Drag Parade) can attend. There won't be alcohol sales until the event is completely finished. Minors can enter for free and adults need to make at least 10,000won of a donation to enter. The donations will be used partially to afford the cost of this event, and the rest will be donated to LGBT Youth Support Centre "DDingDong". *There will be English translation for important parts of the event, however, the event will be in Korean for most parts.